So I was very excited the other day when I saw that my copy of Laniakea by Sovereign Council had arrived (and earlier than I had expected no less)! I have written in the past about how excited I was for this album, so I busted it out and have listened to it a few times now. Unfortunately, I'm not a very learned music reviewer, so this will probably be more impressionistic and less in-depth than my movie or video game reviews (not to mention that music might be the most subjective medium to attempt to review), but I'm going to try to tackle this anyway. 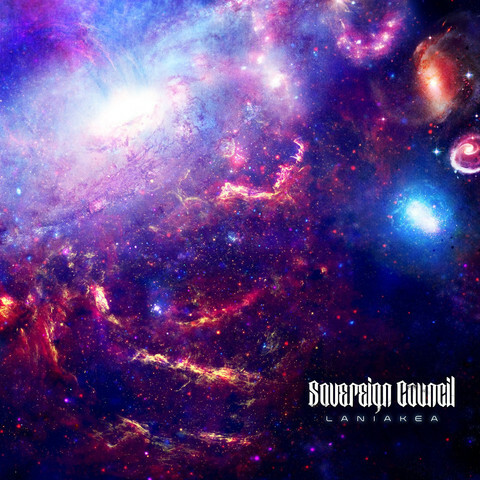 If you're familiar with Sovereign Council's debut album, New Reign, then the first thing that will probably strike you about Laniakea is just how ambitious it is. It's obvious the band decided to step things up and pour their souls into this release, because it really shows in basically every facet of the production. This shows perhaps most clearly in the lyrics. Most of the songs on Laniakea follow a non-traditional structure (as in, they do not feature rhyming couplets and don't necessarily follow the verse/chorus/verse/chorus/bridge/chorus structure that typifies most popular forms of music). While the lyrics were the sole weak point on New Reign, the songwriting has been stepped up quite significantly, and the non-traditional structure works quite well. There are still a couple awkward moments (most notably on "The Human Condition", where the line "I only see one constant failure to perfect" doesn't flow very well and makes the song stutter for a moment), but these are just as often offset by some very cool songwriting ("Decima" features the epic repeated verse "it's the only way to enjoy the slow ride into the afterlife", which just makes me want to sing along). In addition, Laniakea also happens to be a concept album, a feature which I did not expect going in. This cohesion actually makes the individual songs feel more meaningful. I'm usually pretty bad at deciphering concept albums, but on a very basic level, the album seems to follow the life of a man who seeks knowledge and wants to overcome human weakness - particularly the ultimate equalizer, death. To that end, the album remains quite consistent and slots into the power metal genre very comfortably. While ambitious is the buzzword that I'd say most clearly typifies Laniakea, Sovereign Council have also clearly matured since New Reign, and wisely keep themselves from overstuffing the album in the pursuit of ambition. They have refined their sound in a very deliberate manner, making Laniakea's sound feel very polished and cohesive, while also allowing for some diversity to keep things fresh from song to song. While the album features 14 tracks, none of them feel like filler. The vocals have also gotten far more diverse. There is far more interplay between Alex and Lisa now, and when they join together in vocal harmony, we get some of the absolute most powerful moments on the album. Also, I have to give a shoutout to whoever the band member is doing the death growls (I regret that I don't know who it is), they really punctuate the lyrics whenever they appear, particularly on "Nona". As for some track highlights, the album opens with "Rise", which de-emphasizes the vocals in favour of showing off the expertise of the musicians and the guest violins. It's a good preview of the rest of the album to come. "The Burden of Life" is definitely one of the stronger songs on the album, with the vocal harmonies of Alex and Lisa mixing with the death growls to create a very pleasing sound. "The Human Condition" is, I think, meant to be the "Bring It Down" moment on this album, and is probably the most relentlessly heavy and fast-tempo song on the album, while also tackling some pretty interesting themes. However, as far as I'm concerned, the real crown jewel of the album is the trifecta of "Morta", "Nona" and "Decima". While they are technically 3 separate tracks, as far as I am concerned they should be viewed as a single 10-minute epic. "Morta" opens slowly, building up appropriately to make the heavy stuff later more effective, while the death growls on "Nona" are contrasted fantastically with Lisa's much softer vocals. Finally, "Decima" just blows the doors right off as the vocals and music get raised to equal prominence and we get a passionate and aggressive conclusion. All-in-all, if you have any interest in hard rock or metal music and are in the market for something distinctly ambitious, I recommend giving Laniakea a look. While there is probably still some room for improvement in the future, Sovereign Council has poured their all into creating a really professional product, and the results do not disappoint. UPDATE: Okay, I just saw Sovereign Council in concert for their album release celebration, and they were fantastic. If you get a chance to see them live, then just do it. I want to clarify a couple things though. First off, the person doing the death growls/screams on the album is Alex, which is even more impressive than I first thought. Secondly, I want to clarify that my thoughts on the lyrics on New Reign were just my opinion, confined to a handful of songs which stood out, and even then I really love that album regardless. Just figured I'd mention that because I was super surprised (and humbled) when it turned out that people had actually read this review and I don't want anyone to get the wrong ideas because of my potentially crappy impression.